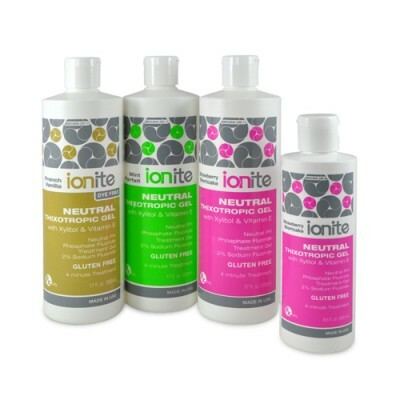 Ionite Neutral is a 4-minute neutral PH phosphate fluoride gel. It is a very reliable thixotropic gel as it flows easily during tray placement and its thick pudding consistency minimizes the risk of ingestion and assures maximum contact with all tooth surfaces. It’s specially formulated flavors prevent bitter aftertaste and give patients a pleasant taste. Its neutral PH makes is ideal for patients with cosmetic restorations or intolerance to acidic fluoride. Our French Vanilla Gel contains no dyes which makes it ideal for use after whitening procedures & for patients intolerant to colorants and dyes. • Vitamin E: this ingredient provides beneficial antioxidant effects.